For other uses, see Metis (disambiguation). 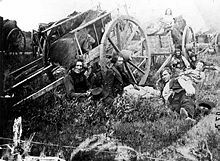 The Métis (/meɪˈtiː/) are members of ethnic groups native to Canada and parts of the United States that trace their descent to both indigenous North Americans and European settlers. Originally the term applied to French-speaking mixed-race families, especially in the Red River area of what became Manitoba, Canada; in the late 19th century in Canada, those of mixed English descent were classified separately as Mixed Bloods. Since the late 20th century, the Métis in Canada have been recognized as a distinct aboriginal people under the Constitution Act of 1982; they number 451,795 as of 2011. Smaller communities identifying as Métis exist in the U.S. The word derives from the French adjective métis, also spelled metice, referring to a hybrid, or someone of mixed ancestry. :1080 In the 16th century, French colonists used the term métis as a noun for people of mixed European and indigenous American parentage in New France (Quebec) and La Louisiane in North America; at the time, it applied generally to French-speaking people who were of partial ethnic French descent. (It is related to the Spanish term "Mestizo", which has the same meaning.) It later came to be used for people of mixed European and indigenous backgrounds in other French colonies, including Guadeloupe in the Caribbean; Senegal in West Africa; Algeria in North Africa; and the former French Indochina in Southeast Asia. In Latin America, a similar word is mestizo in Spanish-speaking countries, and in Portuguese-speaking countries, mestiço is also used. The English word mestee is a corruption of the Middle French mestis (the letters 's' both pronounced at the start of the Middle French period, and both silent at the end of the Middle French period). It has also been used to refer to people of mixed race born generally to indigenous women and French men in New France. The Métis in Canada married within their own group, and over time, created a distinct culture and ethnicity of their own. In former French colonies where slavery was part of society, a group known as gens du couleur libre (free people of color) developed from unions between African or mixed-race women and French male colonists. In New Orleans, the system of plaçage was well developed in the eighteenth century, in which women in these relationships received some protection by contracts, often negotiated by their mothers. Often the men freed the women, if they were enslaved, and their mixed-race children, if born into slavery. Property settlements were also part of the relationship, and the men sometimes provided for education of sons, sometimes in France. The term mestee was widely used in the antebellum United States for mixed-race individuals, according to Jack D. Forbes. It was used for people of European and Native American ancestry, as well as European and African, and for those who were tri-racial. In the 19th century and up until 1930, United States census takers recorded people of color as mulatto, also meaning mixed race. After the American Civil War, the term "mestee" gradually fell into disuse when millions of slaves were emancipated as freedmen. As conservative whites in the South worked to re-establish white supremacy, they imposed Jim Crow laws after regaining control of state legislatures. In the early 20th century, they passed more stringent laws establishing the "one-drop rule". By this anyone with any known Sub-Saharan African ancestry was legally "Black", a more restrictive definition than had previously operated in the South, especially on the frontier. Scholar Jack D. Forbes has attempted to revive "mestee" as a term for the mixed-race peoples who were established as free before the Civil War. Worldwide, since the early 20th century the term Metis has been applied in various ways. Metisaje was used from the 1920s to the 1960s in some Latin American countries to indicate cultural hybridity, and at times to invoke a nationalist sentiment. Cultural "Hybridity" theorists have used the term "métissage" to examine postcolonial themes, including Françoise Lionnet. Creolité is a cultural and literary movement that has common threads with "métis" identity, and has been a counterpoint to the Négritude movement, although it has also been used to indicate "race and gender specific" themes as well. Written with a small m, métis is the French word for "mixed", and it is used here in a general sense for people of dual Indian-White ancestry. Capitalized, Métis generally refers to people of the post-contact indigenous people, the Métis Nation. It may variously refer to a distinctive socio cultural heritage, a means of ethnic self-identification, and sometimes a political and legal category, more or less narrowly defined. The Métis Nation is considered to be rooted in what is known as the "Métis Homeland," an area ranging from northwestern Ontario and moving westward across the prairies. In this area, fur trappers married indigenous Cree and Saulteaux women. A distinct ethnicity developed, as mixed-race descendants married within this group and remained involved with fur trapping and trading. They also began to farm in the Red River of the North area. People of "mixed ancestry," although not of the Métis Nation, have a distinct history of their own. These unions began in the east, extending from the Atlantic coast to the Great Lakes. The fur trade and colonial development drew French voyageurs and coureurs des bois to the west, along with the later Hudson's Bay Company employees. Wintering partners of the fur trading companies typically took a wikt:country wife for their months away from the eastern cities. After the fall of New France to the British 1763, many mixed-race populations continued to establish themselves, often specializing in the fur trade and related hunting. Some served as interpreters, as they often were fluent in both indigenous and European languages. English and Scottish traders married indigenous women, often the daughters of high-ranking chiefs, forming an elite mixed society. As the eighteenth century ended, the fur trade moved westward into the Plains. The Métis Nation promoted their distinct and unique Indigenous identity in 1812, when Cuthbert Grant led a battle in the Pemmican War, flying the Métis flag. 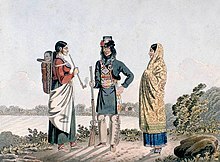 Many treaties throughout Canada were being negotiated in the nineteenth century, including in Ontario with the Robinson–Huron treaty. In 1870 the Métis at Red River, led by Louis Riel, resisted Canada's efforts to take over this area from the Hudson's Bay Company. They negotiated entry into Canada as the province of Manitoba, with promises to protect their land and rights. In 1885, the Métis resisted Canadian colonialism with the North-West Rebellion. The Métis were defeated and Riel was hanged as a traitor to Canada, but his role in history is controversial. Métis in the Métis Nation homeland received scrip under Section 32 of the Manitoba Act,and in the Northwest Territory via a series of Scrip Commissions that accompanied the negotiators of the numbered treaties in the Northwest Territory. Because scrip could only be applied to surveyed land, many Metis could not use it to purchase the unsurveyed land on which they were already living. They often moved onto the road allowances, where no roads had yet been built. The term "Road Allowance people" was used to describe these dispossessed Metis. Racism toward Métis peoples in the west was prevalent during a large part of the late nineteenth and twentieth centuries. In 1982, Métis were included as a distinct indigenous people in the Canadian constitution. They are defined as an ethnic group with their own culture, distinct from First Nations and Inuit peoples. Métis peoples have formed a variety of political organizations to promote their interests, and lobby the federal government through their primary national political association, the Métis National Council (MNC). In 2003, the Canadian Supreme Court ruled in R.V. Powley that a family of Métis people in Ontario had the right to hunt moose as part of their Métis aboriginal rights. This case was funded by the Métis Nation of Ontario (MNO), a provincial affiliate of the MNC. The case established that the Métis had a history in Ontario, which was long debated by many people. The case also established the "Powley test", which helps to define who is Métis, and therefore eligible to rights as an aboriginal person. On April 14, 2016, the Supreme Court in Daniels v. Canada (Indian Affairs and Northern Development) reached a landmark decision, ruling that Métis and non-status Indians are "Indians" for the purpose of s 91(24) of the Constitution Act, 1867. ^ a b c Canada, Government of Canada, Statistics. "The Daily — 2011 National Household Survey: Aboriginal Peoples in Canada: First Nations People, Métis and Inuit". www.statcan.gc.ca. Retrieved 19 April 2018. ^ Peterson, Jacqueline; Brown, Jennifer S. H. (2001) "Introduction". In The New Peoples: Being and Becoming Métis in North America, pp. 3–18. Minnesota Historical Society Press. ISBN 0873514084. ^ Robert, Paul (1973). Dictionnaire alphabétique et analogique de la langue française. Paris: Dictionnaire LE ROBERT. ISBN 978-2-321-00858-3. ^ "MÉTIS : Etymologie de MÉTIS" [Etymology of MÉTIS]. Ortolang (in French). Centre National de Ressources Textuelles et Lexicales. Retrieved July 17, 2017. ^ James Alexander, Simone A. (2001). Mother Imagery in the Novels of Afro-Caribbean Women. University of Missouri Press. pp. 14–5. ISBN 082626316X. ^ Jones, Hilary (2013). The Métis of Senegal: Urban Life and Politics in French West Africa. Indiana University Press. p. 296. ISBN 0253007054. ^ Lorcin, Patricia M. E. (2006). Algeria & France, 1800–2000: Identity, Memory, Nostalgia. Syracuse University Press. pp. 80–1. ISBN 0815630743. ^ Robson, Kathryn and Jennifer Yee (2005). France and "Indochina": Cultural Representations. Lexington Books. pp. 210–1. ISBN 0739108409. ^ Forbes, Jack (1993). Africans and Native Americans: The Language of Race and the Evolution of Red-Black Peoples. Champaign, IL: University of Illinois Press. ISBN 978-0-252-06321-3. ^ Acheraïou, A (2011). Questioning Hybridity, Postcolonialism and Globalization. Springer. pp. 139–40. ISBN 0230305245. ^ "Hybridity in Contemporary Postcolonial Theory" (PDF). State University of New York Press, Albany, 2007. Retrieved July 17, 2017. ^ James Alexander, Simone A. (2001). Mother Imagery in the Novels of Afro-Caribbean Women. University of Missouri Press. pp. 15–6. ISBN 082626316X. ^ Jennifer S.H. Brown. "Métis". The Canadian Encyclopedia. online version. Historica Foundation. Retrieved October 31, 2012. ^ "Métis, non-status Indians win Supreme Court battle over rights". Retrieved 19 April 2018 – via The Globe and Mail. Barkwell, Lawrence. "Metis Rights and Land Claims in Canada". https://www.scribd.com/doc/18197649/Metis-Rights-and-Land-Claims-in-Canada. Accessed October 13, 2018. Barkwell, Lawrence J.; Dorion, Leah; Hourie, Audreen (2006). "Métis legacy Michif culture, heritage, and folkways". Métis legacy series. 2. Saskatoon: Gabriel Dumont Institute. ISBN 0-920915-80-9. Barkwell, Lawrence J.; Dorion, Leah; Prefontaine, Darren (2001). Métis Legacy: A Historiography and Annotated Bibliography. Winnipeg: Pemmican Publications Inc. and Saskatoon: Gabriel Dumont Institute. ISBN 1-894717-03-1. 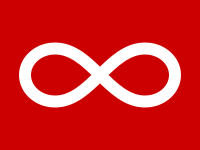 The Rupertsland Institute (Alberta) – A service dedicated to the research and development, education, and training and employment of Metis individuals. It is affiliated with the Metis Nations of Alberta. Along with providing financial aid, the Rupertsland Institute helps Metis individuals acquire essential skills for employment.